It can be easy to think you’re a master gardener. Read a few gardening blogs that teach you how to pinch off undesirable branches and other imperfections, and suddenly you’ve purchased a shiny pair of pruning shears that can really do some damage. If you’ve ever tried to pluck your eyebrows, you know that you get caught up with just pulling different pieces off and then, suddenly, you only have a thin line of hair decorating your brow rather than the full eyebrow that was once there. Amateur tree trimming is much the same. You’ll get clipping and suddenly you’ll have three branches and a trunk left. Don’t do that. If you’re looking to pick up those shiny shears that you’re hoping to just use for a trim here and there between the scheduled maintenance for your trees, then you should be educated about how to proceed. As always, we’re going to start with the big no-nos so you can navigate the process intelligently. Don’t prune after rain, snow, sleet, hail or any other damp conditions. If the humidity is at an all-time high of 80 percent, just stay inside with your dehumidifier and don’t touch the plants. When it’s wet out, there are plant diseases spreading and you don’t want to open up fresh wounds for diseases and other issues to climb right into your trees and kill them from the inside out. Tree trimming allows more sunlight and air to filter through the tree or the shrub. This keeps them healthy and bolsters growth. When it’s time to start pruning, only look to the dead stuff first. If you see sickly branches, feel free to clip them. The way to cut off diseased or even dead plants is cut between the diseased portion and the body of the plant. 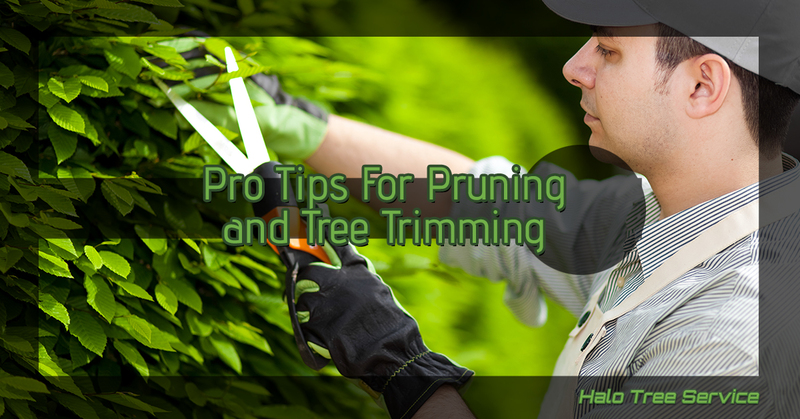 You might consider attempting to prune lightly where branches are crossing or rubbing against one another. We’d recommend taking the authority to take off the branches that are growing vertically and trying to get in the way of passage around the tree. When you’re trimming the tree back, be sure to cut as close to the tree as possible. This is why most folks choose to leave the majority of the trimming to a professional as getting very close to the body of the tree requires expensive and extensive equipment to get close enough and make the most precise cut in one shot. That doesn’t always happen, even with the sharpest nicest shears you can get, simply because you don’t do this kind of thing every day, day in and day out. Winter trimming species don’t have a lot of sap to begin with and the sap they do have falls down and out of the tree’s extremities when the temperatures start to fall. Poplars, spruces, sumacs and fruit trees like being trimmed in the winter, as well as a whole host of other species that makes trimming in winter a more common and popular choice. The trees you should wait until spring to trim include maples, birches, elm trees, walnuts and dogwoods that have a lot of sap to begin with and ooze lots of sap when being cut in the winter. Tree trimming is better left to the folks who do it every day. Reach out to us to schedule your tree trimming maintenance so your trees are ready to grow in beautifully this coming Macomb spring.